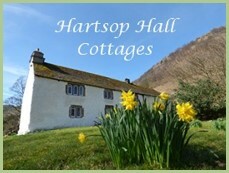 Hartsop Hall is a 16th Century Grade I listed building of great historical significance, owned by the National Trust. It is an important valley-head farm. The house itself contains many fascinating features, such as priest holes – and if you speak very nicely to the farmer, Jimmy Hodgson, he’ll be pleased to show you! There are various outlying barns on the estate, all examples of vernacular Lake District constructions of the 16 th and 17 th centuries, featuring cruck frames, bank barns, etc, as well as our two farm holiday cottages. Hartsop Hall is a working farm of some 3000 acres, with a flock of 800 predominantly Swaledale sheep, and a herd of 30 Aberdeen Angus beef suckler cows and their followers. This is a traditional Lakeland hill farm (most of the land is over 1000 feet above sea level), and will offer you a unique opportunity to see a way of life which is fast disappearing. It is farmed by Jimmy Hodgson, whose three brothers also farm at Rydal, at High Borrans and at Glencoyne on Ullswater. It is one of the only farms in the Lake District still to have a herd of Red Deer in its deeds. There are many well-marked footpaths criss-crossing the land, leading up to the fells in all directions, and for more level terrain, an old bridlepath past the Hall to Brotherswater. This path has been resurfaced by the National Trust and now allows wheelchair users access to the lakeshore. Hartsop Hall is very much a working farm, and Jimmy is always pleased if guests staying at our holiday cottages take an interest, but do remember it is a workplace, and keep your children/dogs under control. Jimmy will be less than pleased if they climb on his silage bales or chase his sheep! Lambing time is late: mid-April to late May, and is always a very stressful time for the farmers, so do respect this situation if you come at this time of year.